The black box outside of the Silver Grove Fire Department on KY Route 8 has nothing to do with fires. 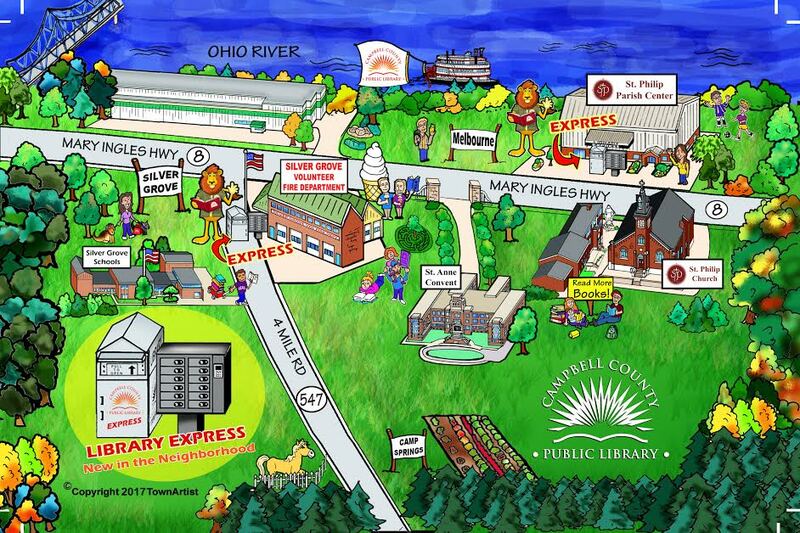 It’s the Silver Grove Library Express, a convenient new way to get library materials. On Tuesday, May 16, a ribbon cutting and dedication ceremony will take place at 11 a.m. at Silver Grove, and then again at 1 p.m. at St. Philip Parish Center in Melbourne, where a second Library Express will be located. Philanthropist Tom W. Jones, an avid supporter of education, donated the funds that allowed the library to purchase the Express boxes and return bins for Silver Grove and Melbourne. Jones, a 1963 graduate of Highlands High School who retired from P&G, has made generous donations to support his alma mater and other causes. The public is invited to attend the ribbon cuttings, which will include a demonstration of how to use the Library Express, the ability to sign up for a library card (with a photo ID and proof of residence), refreshments, and a chance to win two free Cincinnati Reds tickets to the June 3 game against the Atlanta Braves. Deliveries and pickups to the Express locations will take place on Mondays, Wednesdays and Fridays. In the 2015-2016 fiscal year, there were 590,265 visits to the Library and more than 1.2 million items were checked out. More than 84,000 e-materials were downloaded, there were more than 655,000 website page views, and approximately 19,000 calls were made to the free children’s story telling phone line. The Campbell County Public Library operates three branches. The Cold Spring Branch is located at 3920 Alexandria Pike in Cold Spring, phone 859-781-6166. The Carrico/Fort Thomas Branch is located at 1000 Highland Ave. in Fort Thomas, phone 859-572-5033. The Newport Branch is located at 901 E. Sixth St. in Newport, phone 859-572-5035.